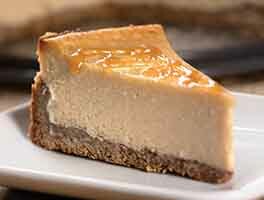 New York-style cheesecake, as its name suggests, is native to the Big Apple. Its signature ingredient is sour cream which, along with a hint of lemon, gives the dense, creamy filling a touch of tang. Baked in a cookie crust, New York cheesecake typically sports cherry or strawberry topping. But feel free to top your cheesecake with blueberries, pineapple, or any fruit you choose. 45 mins. to 1 hrs 55 mins. 1 hrs 5 mins. to 1 hrs 40 mins. *Using 2 cans of cherries will give you enough leftover fruit to serve alongside individual slices. Preheat the oven to 400°F. Lightly grease a 10" springform pan. To make the crust: In a mixing bowl with a paddle, combine the flour, sugar, salt, and butter. Mix until the mixture is crumbly, then add the egg and continue to mix until a soft dough forms. Press the dough on the bottom and an inch up the sides of the prepared pan; prick it all over with a fork, and bake for 15 minutes, until light golden brown. Remove from the oven and cool to room temperature. Reduce the oven temperature to 325°F. To make the filling: Place the cream cheese in a large mixing bowl with a paddle. Add the sugar and flour, and mix at low speed until there are no lumps. Scrape the bottom and sides of the bowl at least twice during this process, to be sure no cheese is sticking. Add the lemon zest, salt, and vanilla, and mix to combine. Add the eggs, one at a time, mixing until incorporated and scraping the mixing bowl between additions. Stir in the sour cream. Pour the filling over the crust and bake for 45 to 50 minutes, until the edges of the cake are set one inch in from the edge. The middle should still jiggle when you nudge the pan; in fact, the cake will look underbaked. Measure the temperature of the cake an inch from the edge: when it reaches 175°F, turn off the oven. Prop open the door, and let the cheesecake cool slowly in the oven for 1 hour. During this time the center will finish setting. Cooling the cake slowly will keep the top from cracking and ensure a smooth, even texture inside. To make the glaze: Whisk together the water, sugar, and cornstarch in a medium saucepan until the cornstarch dissolves. Place over medium heat and cook, stirring constantly, until the mixture boils, becomes clear, and thickens. Remove from the heat and add the food coloring and the drained cherries. Let the mixture cool to room temperature, then spoon it over the cooled cheesecake. Refrigerate the cake until you're ready to serve. You should know: If your cream cheese is at room temperature before you use it, the filling will have fewer lumps. When you mix the cream cheese and sugar together, do it slowly, because you don't want the mixture to have any extra air in it; that would make a poofier cheesecake, not the solid style this dessert is known for. The center of the cheesecake will be quite loose at the time the oven is turned off. Heat will continue to travel from the outside of the cake to the inside; the center will finish cooking as this happens. Cooking the cheesecake too much will cause the eggs to overcook, and the top of the cheesecake to crack. For a swirled cheesecake, remove one cup of batter and flavor with your favorite add-in. For pumpkin, add 1/2 cup pumpkin puree, 1/2 teaspoon cinnamon, 1/4 teaspoon ginger, a pinch of allspice and one egg. Mix well and dollop evenly over the remaining batter in the pan. Swirl together with a sharp knife. Bake as usual. 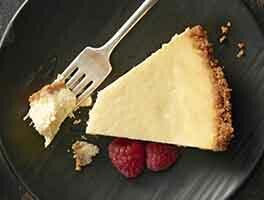 I have tried this recipe and loved it, achieved my first ever cheesecake with only a tiny crack and it was delicious! 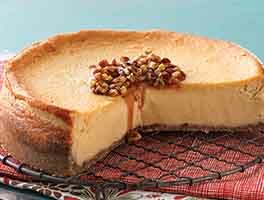 Now I am unfortunately gluten-free, and have no problem swapping the crust, but I am wondering if you have tested swapping the AP flour in the cheesecake with your AP Gluten-Free flour? Have you tried this and/or noticed any issues with the consistency of the cake? Just gotta say WOW. It turned out great first time ever making a cheesecake, so far I have made the KAF pretzels, classic white bread, I made the Italian sub rolls and the cheesecake, and it all turned out really good for the first time. An amazing cheesecake. Great flavors with a perfect lemon Tang. Just a quick question, though, can the lemon zest be replaced with key lime zest for a light, key lime flavor? Having been born in Brooklyn, I fall into the NY style only camp, and this great recipe is similar to the one I have used for years: consistent 325 temp., no water bath, cracking the door open/letting cake sit for an hour. 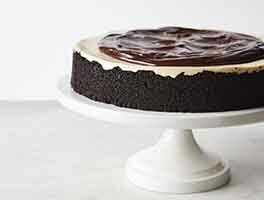 But, it seems there's no consensus re: the proper method for making the perfect NY style cheesecake. Some swear the only way to go to achieve true NY style denseness and texture is high temp (500 x 10 min) followed by a slow bake at 200 for 2 hrs, no water bath. Been too scared to go that route, having read horror stories of the top burning, and I avoid a water bath as it's the preferred method to a achieve a "silky smooth and creamy" finish, which I don't want (not to mention the water leaking issue) so this recipe is a great compromise. My problem is finding the proper method for adding a sour cream topping, which I prefer to a fruit topping. Some say add the topping when "almost done" (what is that? lol) and continue to bake, while others say when done, remove cake and let sit on the counter (anywhere from 15 to 30 mins), return the cake to oven and cook for an additional 10 mins, with temps varying from 325 to 450! They don't say whether to shut the heat off at that point, crack door, etc. 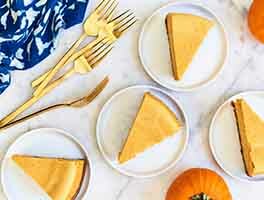 Want to avoid the cake sinking if removed from the oven before "set," and over baking if returned to the oven to finish the topping after the cake is already done! SO confused! Any suggestions? Looks great I want to cook it but how would I make a strawberry swirl on the top? And how can I turn this density of a cheesecake into a chocolate cheesecake. Btw. Best flour you can purchase! I made this for the very first time at Thanksgiving. I followed the recipe exactly and it came out perfect. We cut it a little early, and the center was a bit soft but after it sat in the fridge more, it was perfect. I recommend and overnight rest in the fridge. I was super proud of the cheesecake that I had made. I made this again today, for Christmas and used a Graham cracker crust instead of the traditional cookie crust and theres cracks all over the top of the cake. I dont want to use the easy cheesecake recipe. How can I use this recipe with Graham cracker crust? Is it even possible? Love it. Wondering, where is best for the oven rack be to bake the cheesecake? I made this recipe this last week and it was amazing! The smoothest, creamiest ever! Just beautiful I followed the filling recipe exactly (ingredients and techniques), but used graham cracker crust! The only thing that was difficult was trying to transfer the cake from pan to serving round/plate. ( I used parchment paper under the cake to help but it was still challenging to move. Thanks for a wonderful recipe! Outstanding recipe! My husband and son are cheesecake snobs and they loved it. I followed the recipe exactly but added a sour cream topping as suggested by the KAF helpline and it turned out perfectly. No cracks, creamy and oh so delicious. Thank you! I've made this cheesecake twice now; the first time I made a traditional graham cracker crust, the second I went for broke and made the pie-like crust. I think I prefer the graham cracker crust (just personal preference) but the cheesecake is so good. Great texture and flavor. And really, as long as you follow the steps, easy to make without a crack to be found!